OAKLAND, Calif. (KGO) -- Ahead of the Martin Luther King, Jr. holiday, activists across the Bay Area are mobilizing for what they are calling "96 Hours of Direct Action to Reclaim King's Radical Legacy" part of the "Reclaim MLK Weekend." The activists include members of SURJ, the Bay Area chapter of Showing Up For Racial Justice, a national network of groups and individuals organizing white people for racial justice. Among their goals is to highlight the high rate of incarceration of African Americans. The group also wants to bring attention to what they are calling the ongoing gentrification and displacement, police brutality, educational inequity and other racial justice issues in the Bay Area. In an email to ABC7 News, the group wrote: "Since Mayor Schaaf took office in January 2015, at least 8 Black men have been murdered at the hands of Oakland Police. At the same time, Schaaf and other civic officials have encouraged massive increases in commercial development that is resulting in the traumatic displacement of Black, Brown and working class folks across Oakland. Mayor Schaaf has made it clear that Black lives are less important to her than white and blue lives. Now we're coming to make it clear we see her complicity in Oakland's racial injustice as violent and grounds for her to RESIGN." The group's activities began with a protest in front of Oakland Mayor Libby Schaaf's house on Saturday morning. Mayor Schaaf responded, in part, with an email to ABC7 News, saying: ""Given what is at stake, as a community we have an obligation to acknowledge and work to correct the wrongs of the past and the legacy they have left behind. At the same time we must resist the urge to judge every new set of circumstances on anything other than the facts at hand." 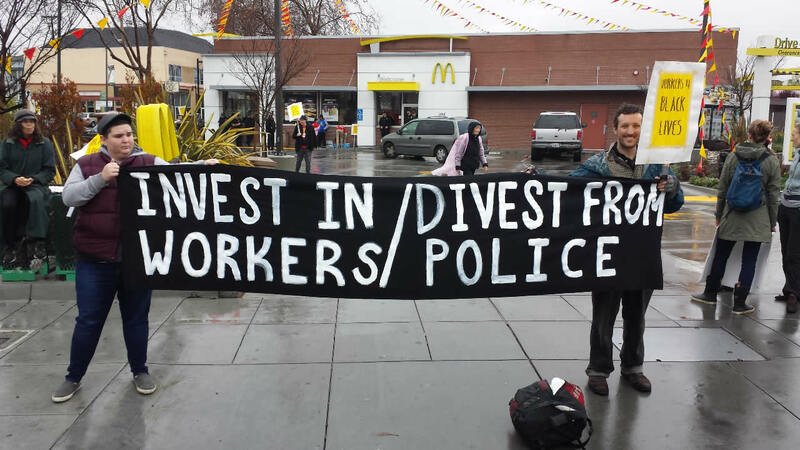 Others protested in front of the McDonald's at 45th Street and Telegraph Avenue in Oakland. They are demanding that the City of Oakland redirect funding from the Oakland Police Department budget into a, "robust enforcement budget of Measure FF," which is Oakland's minimum wage law. They also want to draw attention to "an epidemic of anti-Black racism in the workplace." The McDonald's demonstration is also to bring attention to the case of Carlton Inman, who allegedly was removed from the schedule with no explanation nearly 6 weeks ago. The group's activities will continue through Monday.